Living healthier is about the small choices, and today, our latest recipe illustrates one of those simple choices to make: lean turkey over the fattier kinds of meat. Watch as our HealthWorks volunteers cook up a turkey burger. This recipe can be customized to your tastes by adding vegetables, spices, or cheese. Have you made this recipe? Leave a comment below about what you did to make it yours. Our latest cooking video shows you how to make a healthy batch of salsa with whole wheat pita chips. Salsa is a great dip option because it’s packed with vegetables. Choose a salsa like this that’s fresh over creamy dips for a healthier option. We’re kicking off a series of videos to make your cooking an easier and more enjoyable experience. Watch as some of our HealthWorks volunteers walk you through recipes step-by-step. First up, let’s cover the classic grilled cheese sandwich. We’re also adding some tomatoes, but feel free to add whichever vegetable you most enjoy. Click here to watch our other healthy recipe cooking videos. Did you know that a high-fiber diet may help reduce the risk of obesity, heart disease, and diabetes? Women should try to eat at least 21 to 25 grams of fiber a day and men should aim for 30 to 38 grams a day. Black beans are an excellent source of fiber, so this recipe will help you and 11 of your friends reach that total. Combine scallions, celery and corn in a small saucepan. Add just enough water to cover. Cover, bring to a boil, and reduce heat to medium. Simmer for 5 mins. until vegetables soften. Drain vegetables. Set aside to cool. Combine avocado, cilantro and beans in a large mixing bowl. Add cheese and salsa and mix. When corn mixture has cooled slightly, add to avocado mixture. In a large nonstick pan over medium heat, warm each tortilla for about 15 seconds on each side. Place each tortilla on a flat surface. Spoon 1/3 cup of the mixture into the center of the tortilla. Fold the top and bottom of the tortilla over the filling. Fold in the sides to make a closed packet. When all tortillas are wrapped, place in a baking pan and bake for 5 minutes, until burritos are warm and cheese is melted. Take a picture of your burrito fiesta and upload it to Instagram or Twitter with the hashtag #healthypsu. 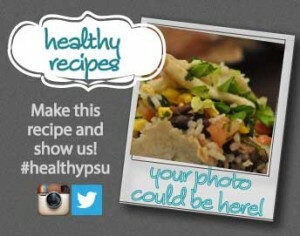 Your photo could be the featured image! Get in touch with your creative side in the kitchen! Parfaits are a great way to enjoy dairy, grains, and fruit all in one delectable cup. This particular parfait contains apples and cranberries. Both are good sources of Vitamin C, which helps to heal wounds and cuts and keeps teeth and gums healthy. You can find the nutritional information for other fruits and vegetables here. In a small bowl, combine applesauce, cinnamon and nutmeg. Place half the granola into a serving cup. Layer with yogurt, applesauce and dried cranberries. Sprinkle with remaining granola and enjoy. Did you try using other ingredients? Comment and share your experience with fellow healthy cooks. 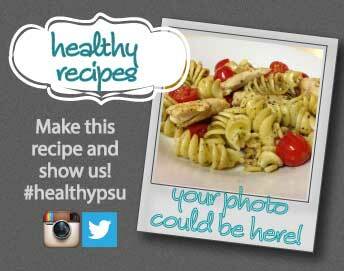 Upload your masterpiece on Instagram or Twitter with the hashtag #healthypsu. Your photo could be featured here! Pasta is one of the easiest foods to make and always tastes great. Grains are an essential part of a healthy diet and have been linked to a lower risk of heart disease, diabetes, certain cancers, and other health problems. The 2010 Dietary Guidelines for Americans recommends that at least half of the grains eaten in a day should be whole grains because they are the healthiest kinds of grains. This recipe uses whole wheat pasta, which can be found at almost any grocery store. Bring a large pot of slightly salted water to a boil. Add pasta and cook for 7 to 9 minutes or until al dente; drain. Heat oil in a large skillet over medium heat. Sauté garlic until tender, then stir in chicken. Season with red pepper flakes. Cook until chicken is golden, and cooked through. In a large bowl, combine pasta, chicken, grape tomatoes, and pesto. Toss to coat evenly. 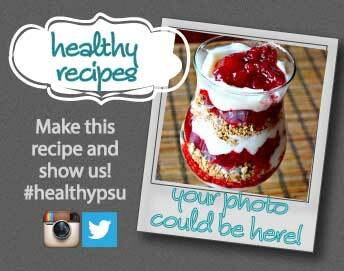 To show off your creation, take a picture and upload it to Instagram or Twitter with the hashtag #healthypsu. Your picture could become the featured image! Samantha Schwartz is a Penn State senior studying public relations. 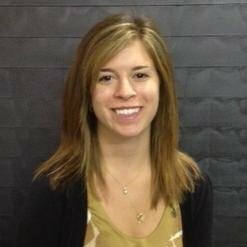 She is interning atPenn State University Health Services, assisting with the Healthy Penn State initiative.